The Mission Urn From MCS Supply Inc. 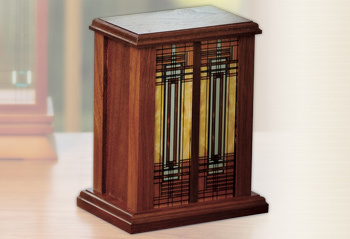 The Mission urn is handcrafted from beautiful dark walnut wood and features twin panels of detailed decorative glass. The bottom is secured by four screws and removable for access. MISSION 6 ½" x 3 ¾" x 8" 83 Cubic"